I found my favorite Mexican restaurant last week. Or the reincarnation of my former favorite Mexican restaurant in Columbus. Casa Hacienda Grill has been open since 2011 but I never knew it. Never saw it? 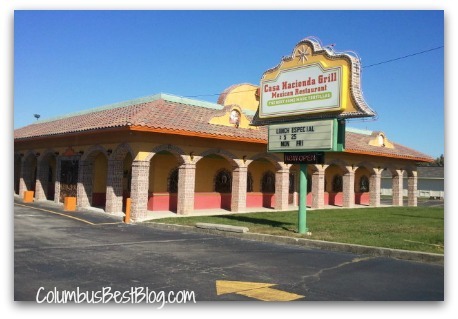 Or maybe I saw it and never recognized it as the reincarnation of La Hacienda Real which was on Sinclair Rd. I get on I-71 at 161 often but from the other side. I would have come up I-71 and turning toward Worthington until January or February of 2012. I saw it after dark on October 9, 2012 and hoped there was a connection. I Googled it and read glowing reviews. Two days later I went to Casa Hacienda Grill for lunch. The metal work on the doors reminded me of La Hacienda Real. The decor even more so but when they delivered the chips and their accompaniments I knew Casa Hacienda Grill was the reincarnation of my favorite Mexican restaurant in Columbus, La Hacienda Real. There is a Columbus Alive review in the entrance, I took my glasses and went back to read the restaurant review. 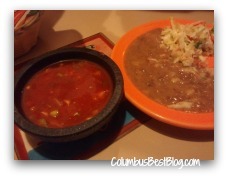 The Columbus Alive review of Casa Hacienda Grill was published in December 2011. I will have to make up for lost time. Next post: Columbus, Ohio is it Time?